The General Henry Knox Museum is a not-for-profit 501(c)(3) organization which relies on the generosity of its supporters to survive. Membership dues, tour admissions, and ticket and gift shop sales do not cover the costs needed to operate the Museum. Each year we look to donations to help us keep the story of Henry Knox alive. Supporters may donate any amount in unrestricted funds, allowing Knox Museum to pay its bills and keep the doors open so that we may continue to offer quality education, preservation, military, and community programming throughout the year. Knox Museum is now partnered with Amazon Smile, a service run by Amazon where a small portion of purchases is donated to a selected charity. Click here and select “Friends of Montpelier” and shop at smile.amazon.com to begin supporting the Museum. Comes with two free museum admission passes. Comes with four free museum admission passes. 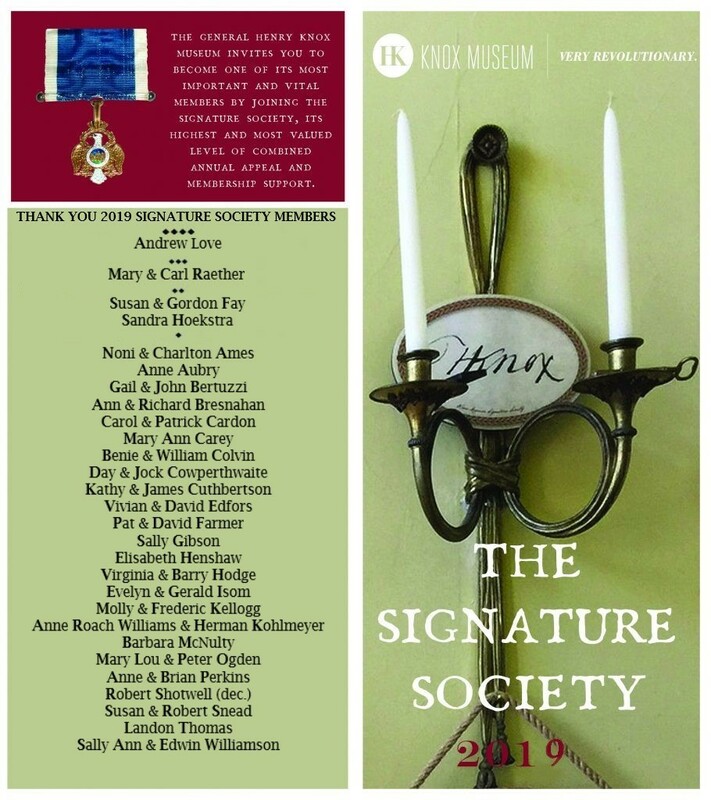 Consider becoming part of the Knox Museum Signature Society if wanting to donate more than $1000. We depend on our volunteers! During the summer they do everything from greet visitors at the door and provide orientations and guided tours, to ring up purchases at the Museum Gift Shop. Behind the scenes, volunteers assist us year round with planning, implementing and publicizing our programs, overseeing our collections, raising funds, soliciting memberships, providing educational materials and tours to area school children, stocking the Museum Gift Shop, maintaining our web pages and the myriad of other tasks necessary to keep the museum operating smoothly. Additional volunteers are urgently needed and warmly welcomed. If you live or summer in this area and would like to donate your skills and time, please call (207) 354-8062 or fill out the volunteer information sheet below. The Signature Society combines major gift levels of Museum membership and annual appeal support to qualify for special benefits. The purpose of this society is to encourage the levels of financial support required both to sustain and to expand the museum’s programs and services. Society members will receive one appeal for a combined membership and annual appeal donation each September. Additionally, gifts of $1000 automatically bestow Signature Society membership and privileges upon the individual donor. Foundation support does not apply. Benefits, detailed below, include special recognition as Signature Society members, and unique privileges such as a 25% museum shop discount, specially-scheduled private tours, discounted rental use of the facilities, and honored guest status at the museum’s annual premier benefit. Your support keeps history alive. Through the life of Henry Knox and his family, midcoast Maine history is uniquely intertwined with the history of the American Revolution and our founding fathers. Through strong support from those who value this history, Knox Museum strives to keep alive a knowledge and appreciation of the life and times of Henry Knox. Frothingham bed (dubbed a “gem” by noted antiques dealer Leigh Keno) and become a member of the “Bedfellow Society.” This unique bed is a true historic treasure, and the crown jewel of Knox Museum’s collections. Phase II Fundraising – Knox Museum is raising $30,000 for Phase II of a three-phased project to restore the General’s Bedroom. Phase I restored the room with historically accurate paint and wallpaper: Phase II is restoring the bed itself; and using the 1806 inventory of the Mansion, Phase III will research and secure appropriate carpeting and other bedroom furnishings. Help us raise the remaining $5,000 needed to meet the $30,000 Phase II need, so restoration can continue. Gifts will support research on the bed, restoration work, and period hangings. Download a donation form below to return by mail, or contribute online through PayPal. There are several creative ways that you might support the Museum through estate planning.